Remember that for one week, starting on Sunday October 30, France and the United States are just a bit closer. 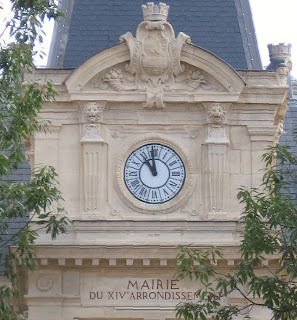 Yes, just my little public service announcement reminding you that residents of France will move their clocks back one hour on Sunday October 30 at 3 a.m. In the U.S., the "fall-back" will take place on Sunday November 6. So for one week the time difference between East coast U.S. and France is 5 hours (8 hours for California). All my francophile life, I've dreamed of living on a houseboat -- une peniche -- on the Seine. That desire was reinforced when I happily happened upon -- and devoured -- Mort Rosenblum's The Secret Life of the Seine. "It is agreeable, as the French say, to take a candlelight cruise without leaving home. You can go away for a weekend and not pack. Your morning alarm is those ducks quacking. Friends visit without coaxing. [A visiting pal] dropped into a deck chair. When a bateau-mouche passed, she flung out her arms and yelled, ‘Envy me.’"
Precisely the emotion I was aiming for! Rosenblum's tale of life on the Seine, and the history of the river, is a timeless classic: one to read ASAP. And re-read. I may yet stay on the Seine some day -- I also have a friend who has lived on a houseboat in Neuilly for the past 30 years. So who knows? Meanwhile, I have found the best possible alternative: a houseboat in Sausalito, California. My wonderful friend Stephanie, observing the somewhat hellish month of September I'd been experiencing, said "Why don't you stay on our houseboat for a while? We don't have any tenants right now, and --" I cut her off at the pass, and jumped at the opportunity. So here I am, living the life on a glorious houseboat. It may not be the Seine, but Sausalito is a bit of heaven on earth. And this houseboat is, as Steph put it, "a temple." It floats my boat, that's for sure. Luxurious and spacious, it offers more room than I need as a solo tenant, yet still feels cozy. birds being the only noisy neighbors. The tranquility is absolute tonic for the soul, and it's a great spot to write and get work done. Then it's all I can do to pry myself from the steam shower: pick your favorite jet stream of water, overhead, sideways, and play favorite tunes on the radio shower while you're at it. And discovering Sausalito has been such a blast. Next door is Le Garage, a fabulous French bistro that attracts customers from all over and has the best kirs this side of the Atlantic. To burn off all those delicious calories, within a five minute walk I can be at a small beach, a kayak rental place, a bike rental spot, or a center for open-water rowing. The oarsmen and oarswomen row by my bedroom window at an impressively early hour. This is the life. I don't ever want to leave. But real life beckons, and so fairly soon I'll pack my bags and go back to reality. And this place is available for rent! Check out the listing at CHBO, property 7827. You can live the life, too.